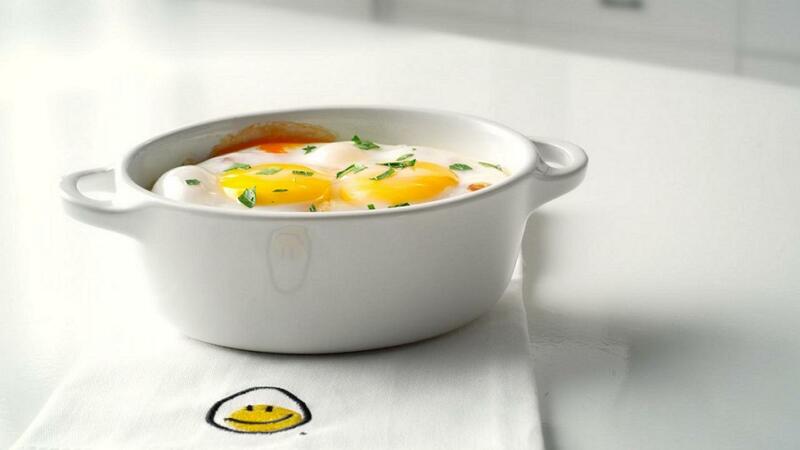 A baked egg dish can be an easy and time efficient means to get a healthy and hot breakfast to the table. All of the components can be prepared the evening before and while the eggs bake you can take care of the other 50 things you need to do in the morning. Preheat oven to 375°F (190°C) and place 4 individual baking dishes (large ramekins or oval shallow dishes) onto a baking tray. In a bowl, toss the potatoes and peameal bacon with the oil and season lightly with salt and pepper. Divide between the 4 dishes. Spoon ¼ cup (60 mL) of chili sauce over each dish. Break 2 eggs into each dish. Bake uncovered** for about 20 minutes (depending on desired doneness). Lift each dish onto a napkin-lined plate and sprinkle with parsley before serving. ** For more of a “sunny side up” effect, cover the dishes for the first 15 minutes of baking.